When describing my 3X weekly training sessions I do during my lunch break, I’ve found the easiest, most accurate description is “MMA for self defense, not sport”. For those that even know what MMA is (“mixed martial arts”) they immediately understand the reference to it not being for sport. In regulated MMA bouts, there are many things off limit, like the gouging of eyes, striking of throats, and kicking of groins. Exactly the type of techniques you want to use in a real life self defense scenario! For those who know martial arts, I can usually make reference to studying MMA from an aikido perspective and they at least begin to understand why. I’ve been asked if this is Hard Aikido. It’s really not. Hard Aikido appears fairly effective (and darn cool), but it still involves just too many complex moves, and suffers against attacks that are based in grappling. The Hard Aikido moves are beautiful – a true art – but the spheres involved are just too large. The aikido that my sensei is drilling into me uses very small spheres, usually transitioned to by something in Brazilian Ju-Jitsu, Muay Thai, or Wing Chun, depending on the distance of the original attack. Spheres? What are spheres, you ask? Learn more. For those who have no idea what MMA refers to, they still understand the “self defense, not sport” reference refers to my lack of interest (but not respect) for progressing to higher levels (belts) or doing sport competition. It’s simply me, my sensei, and a desire to learn very practical techniques to protect my family and friends. I put together the attached diagram to quickly describe what our training is beginning to look like in a flowchart manner (because I’m a dork for diagrams). It’s based off a quick flowchart my sensei drew (as an artist, he also tends to diagram alot; we have a whiteboard in the dojo). As you go through life, you practice continuous, calm awareness, noted on the left side of the diagram. When a situation progresses from normal (green) to cautionary (yellow) to immediately dangerous (red), my hope is that I train my mind/body to respond automatically in those high stress situations. Scientific writers describe this auto response as an “autonomic reaction” – an automatic response of the mind and body at a subconscious level. Aikido writers refer to this “move second, strike first” concept as harmonizing, or welcoming the attack. 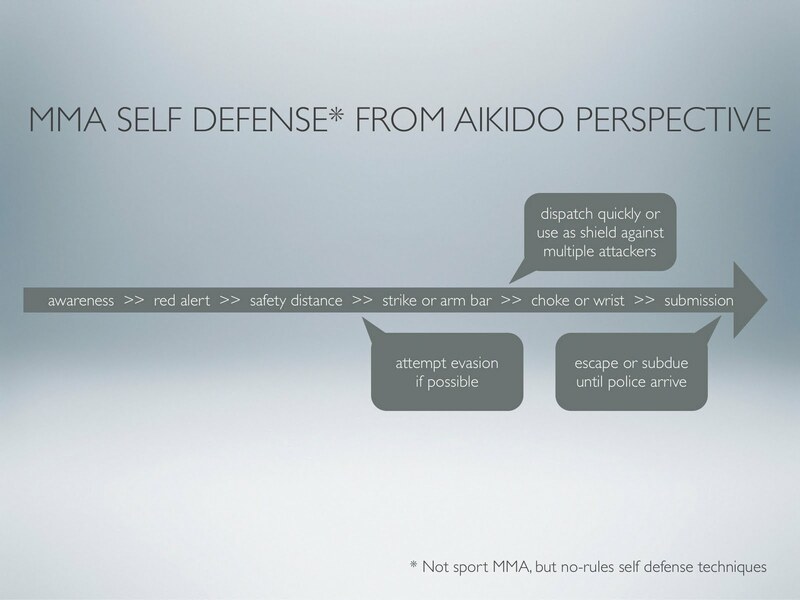 Your awareness to an attacker (moving first) enables you to blend with the attack (moving second) and still land the first blow (striking first). The blow might be a parry done while spinning to one side, but if done in the correct “always thinking forward” mindset, the first strike disables the attacker’s would-be blow. Of course, the primary goal would be to evade those situations anyway, even before they hit the caution stage. There are thousands of techniques in the various martial arts that we *could* study, but won’t. Unless you are logging decades of concentrated study inside a dojo, all those techniques just won’t work in a high stress situations when your “fight or flight” adrenaline has taken over your brain and body functions. But if you know a few relatively simple and fast techniques very, very, very well, the mind/body should be able to protect you and your loved ones when it goes into auto-drive. This is what I am striving for in my training.